Priscilla White knows she'll never be a wife or mother and feels God's call to the mission field in India. Dr. Eli Ernest is back from Oregon Country only long enough to raise awareness of missions to the natives before heading out west once more. But then Priscilla and Eli both receive news from the mission board: no longer will they send unmarried men and women into the field. Left scrambling for options, the two realize the other might be the answer to their needs. Priscilla and Eli agree to a partnership, a marriage in name only that will allow them to follow God's leading into the mission field. But as they journey west, this decision will be tested by the hardships of the trip and by the unexpected turnings of their hearts. 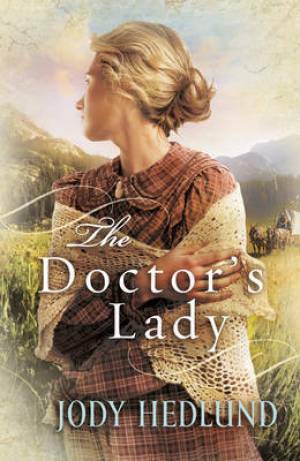 The Doctor's Lady by Jody Hedlund was published by Baker in October 2011 and is our 14987th best seller. The ISBN for The Doctor's Lady is 9780764208331. Jody Hedlund first captivated me with her debut novel, The Preacher’s Bride. What struck me most about Jody’s writing was her ability to take a short page from history and reconstruct it with passionate creativity and insightful prose. Her second publication, The Doctor’s Lady, met the same level of ingenuity as it brought to life a missionary tale from the early 19th Century of the first white woman to cross the US Continental Divide. Set initially in Angelica, New York, the story follows a young, single woman – Priscilla White (any English reader will be amused at the name, but will soon forgive Jody for not realising the celebrity connection) – whose strong faith has given her a determination to enter into the mission field. With her heart set on serving in India, Priscilla’s dreams are shattered when she is rejected by the Mission Board for her single status. Simultaneously, we are introduced to Dr. Eli Ernest who is unable to fulfil his dream of reaching the Nez Perce tribe of the American West for the same reason. With much persuasion, and despite Priscilla’s naivety and petite frame, Eli agrees to a marriage of convenience and allows her to accompany him on the long, arduous journey to Oregon Country. We are then swept up in a journey of physical hardships, emotional struggles and faith-sharpening trials, as well as the joy of witnessing gentle tugs on their heartstrings along the way. Based on the true story of Marcus and Narcissa Whitman – with a few imaginative plot lines thrown in for good measure – The Doctor’s Lady is all-in-all a fascinating read. Jody’s third book is due for release in September, and I’m looking forward to seeing what other literary and historical surprises she has in store for us. Jody Hedlund first captivated me with her debut novel, The Preacher�s Bride. What struck me most about Jody�s writing was her ability to take a short page from history and reconstruct it with passionate creativity and insightful prose. Her second publication, The Doctor�s Lady, met the same level of ingenuity as it brought to life a missionary tale from the early 19th Century of the first white woman to cross the US Continental Divide. Set initially in Angelica, New York, the story follows a young, single woman � Priscilla White (any English reader will be amused at the name, but will soon forgive Jody for not realising the celebrity connection) � whose strong faith has given her a determination to enter into the mission field. With her heart set on serving in India, Priscilla�s dreams are shattered when she is rejected by the Mission Board for her single status. Simultaneously, we are introduced to Dr. Eli Ernest who is unable to fulfil his dream of reaching the Nez Perce tribe of the American West for the same reason. With much persuasion, and despite Priscilla�s naivety and petite frame, Eli agrees to a marriage of convenience and allows her to accompany him on the long, arduous journey to Oregon Country. We are then swept up in a journey of physical hardships, emotional struggles and faith-sharpening trials, as well as the joy of witnessing gentle tugs on their heartstrings along the way. Based on the true story of Marcus and Narcissa Whitman � with a few imaginative plot lines thrown in for good measure � The Doctor�s Lady is all-in-all a fascinating read. Jody�s third book is due for release in September, and I�m looking forward to seeing what other literary and historical surprises she has in store for us. The Doctor?s Lady is all-in-all a fascinating read. Jody Hedlund first captivated me with her debut novel, The Preacher?s Bride. What struck me most about Jody?s writing was her ability to take a short page from history and reconstruct it with passionate creativity and insightful prose. Her second publication, The Doctor?s Lady, met the same level of ingenuity as it brought to life a missionary tale from the early 19th Century of the first white woman to cross the US Continental Divide. Set initially in Angelica, New York, the story follows a young, single woman ? Priscilla White ? whose strong faith has given her a determination to enter into the mission field. With her heart set on serving in India, Priscilla?s dreams are shattered when she is rejected by the Mission Board for her single status. Simultaneously, we are introduced to Dr. Eli Ernest who is unable to fulfil his dream of reaching the Nez Perce tribe of the American West for the same reason. With much persuasion, and despite Priscilla?s naivety and petite frame, Eli agrees to a marriage of convenience and allows her to accompany him on the long, arduous journey to Oregon Country. We are then swept up in a journey of physical hardships, emotional struggles and faith-sharpening trials, as well as the joy of witnessing gentle tugs on their heartstrings along the way. Based on the true story of Marcus and Narcissa Whitman ? with a few imaginative plot lines thrown in for good measure ? The Doctor?s Lady is all-in-all a fascinating read. Jody?s third book is due for release in September, and I?m looking forward to seeing what other literary and historical surprises she has in store for us. Got a question? No problem! Just click here to ask us about The Doctor's Lady. Hi, what age range are these suitable for? I have a 14 year old who is getting into historical romances. Thanks.